It’s still unclear whether the Matthysse-Pacquiao fight will take place due to the money not having come through, according to Dan Rafael. The fight was originally supposed to be televised on ESPN pay-per-view, but it will now be shown on ESPN or ESPN+. Arum isn’t sure whether the Pacquiao-Matthysse fight is going to take place, but if it doesn’t, then he’ll potentially look to offer Matthysse a fight against the 30-year-old Crawford (33-0, 24 KOs), who is coming off of a 9th round knockout win over World Boxing Organization welterweight champion Jeff Horn (18-1-1, 12 KOs0 on June 9 at the MGM Grand in Las Vegas, Nevada. That was an easy win for Crawford, as he dominated the Aussie Horn from start to finish before stopping him in the 9th round. 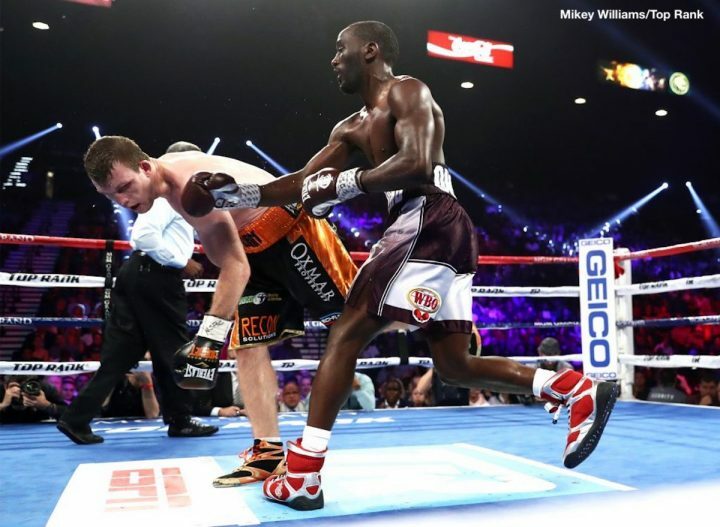 Arum tentatively has Crawford coming back to make his first defense of his WBO 147 lb. title on October 13 on ESPN at the CenturyLink Center in Omaha, Nebraska. For the time being, Top Rank fighter Jose Benavidez (27-0, 18 KOs) is being targeted by the 86-year-old Arum to match against Crawford for the October 13 fight date. That fight hasn’t generated any interest from the boxing world though, as Benavidez is not seen as a major talent despite having an unbeaten 27-0 record. The vast majority of Benavidez’s wins during his career has come against C-level fighters with poor records. Benavidez’s best win of his career is a controversial 12 round decision over Mauricio Herrera in 2014. Most boxing fans felt that Herrera deserved to have his hand raised at the end of that fight. “I don’t know what’s going to happen with the fight, but if it doesn’t happen, I would hope to talk to Golden Boy about having Matthysse fight Crawford,” Arum said to ESPN.com. Arum can probably come up with a big enough money offer to get Matthysse to take the fight with Crawford, but it remains to be seen whether Golden Boy Promotions will agree to making that fight. The money that Matthysse will get from fighting Crawford won’t be extraordinary, as the Nebraska native isn’t a PPV fighter. Matthysse, 35, can do better if he merely makes title defenses of his WBA World title against the available contenders in the division. The Pacquiao fight will likely happen sooner or later for Matthysse. There’s also #2 WBA Jessie Vargas and #3 WBA Jamal James. Those are both winnable fights for Matthysse. If he takes those fights back to back, he should make the same kind of money he would get fighting Crawford and have much better success.